There is no doubt keeping your Goldfish healthy is the most important aspect of fish keeping hobby. Being a hobbyist myself, I've come across different scenarios and conditions and from there, I've learned how to deal with the problems. The blog post here is meant to share some of the most Frequently Asked Questions (FAQs) related to your goldfish’s health. Hopefully this will help to enrich your knowledge so that you are better prepared to face the challenges ahead. Q: I noticed there are pockets of air bubbles trapped in the poop. How do I prevent this and what are the adverse health effects that the condition can cause? A: Goldfish is a very greedy fish and they often show extraordinary appetite during feeding time. Do you notice that when you drop your floating fish food into the water, all of them will try to gobble up the food as soon as possible before the other fish managed to grab it? This is made even harder for those fancy varieties of goldfish with hood covering their head such as ranchu and oranda whereby they will have difficulties trying to navigate their way to grab the food and in the process, swallowed air leading to accumulation of air pockets found in the poop. These air pockets are known to be one of the causes of swim bladder disorder although there are other contributing factors as well. To prevent this from happening, what you can do is to change their diet to use different types of sinking pellet or combine with a mix of live foods. Sometimes feeding your goldfish with peas can also help to get rid of the trapped air pockets. Q: I have difficulty maintaining the right 6.5 – 7.0 pH value. Will that cause my goldfish to be sick? A: Having difficulty maintaining the pH at the desired range can be quite difficult especially if you have goldfish tank. The reason why is because being a heavy eater, goldfish usually discharge high amount of waste to the water and cause the pH value to rise. This is made even more difficult for newly setup tank whereby beneficial bacteria population has not yet fully established. Sometimes, you might see the pH goes way up to 8.5 but there is actually nothing to worry about. The fish is highly adaptable to changes in water parameters and going above the range does not necessarily mean they will fall sick. As long as it doesn’t go up further than that, and you constantly check the ammonia level using pH test kit, everything should be fine. Sometimes instead of using a pH adjuster sold at pet stores, the best solution is to conduct 20% water change to bring down the value. Q: The bright red color of my goldfish has turned into orange pale color. Is that a sign that the goldfish might be sick? A: Contrary to common belief, losing natural colors does not necessarily mean that the fish is sick. In fact, one of the common problems causing color change is because the fish is not getting enough sunlight exposure. Most goldfish breeders actually kept their special prize winning fish in outdoor ponds and not indoor as one would expect. Being kept outdoor, the fish not only has more room to swim and grow but they are also exposed to sunlight giving them to chance to develop their true natural colors. Food and nutrition is also another aspect related to color change and if your goldfish does not get the right balanced diet, it tends to lose color overtime. Always provide good mix comprising different variety of dried and live foods for your goldfish. Q: My goldfish is getting too fat, how do I address the weight problem? A: First thing first, do not overfeed. Most aquarium owners have the wrong perception that goldfish needs a lot of food to stay healthy. This is definitely not true because as long as there is food, the fish will try to finish all of it and everything that they can find. Overfeeding always lead to weight problem and this will adversely affect the health of your goldfish. Feeding twice a day is actually more than enough and the amount of food that you put in should be finished in about 2 minutes time. Use the same measurement to adjust the quantity of food to put in and reduce the amount if you notice your goldfish starts to put on weight. 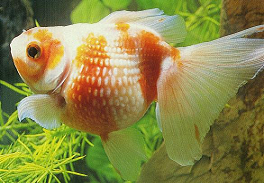 Certain goldfish varieties like the pearlscale (above picture) has a round shaped appearance and thus do not mistaken this natural condition as being fat. At times if you notice that the body suddenly become bloated with raised scales, then the condition on what you are seeing is actually related to dropsy. In this case, it is actually a common lethal aquarium fish disease affecting goldfish. Learn about best way to care for your goldfish.